So a quick recap: Tar Abhaile was broadcast on the Irish language channel TG4 in the six weeks leading up to Christmas. Each week two people were featured who had ancestors that emigrated from Ireland. They hoped to find the townland of origin of their ancestors, or if already known, find out more information about them. Tar Abhaile continues a recent trend in genealogy programming (for example, another show created in Ireland, the Genealogy Roadshow, is now on PBS in America) where the focus is not a celebrity but a regular salt-of-the-earth working man or woman. This is genealogical research that everyone of Irish descent can connect with. One of the strengths of this show was how a different era of emigration from Ireland was featured each week. The makers of the show avoided falling into the trap of only showing the descendants of Famine emigrants. Over one million people emigrated from Ireland during these tumultuous years, but many more emigrated in the decades before and after. If a second season of the show is made I would have one main recommendation; showing an example of just one document from the North American side would be very useful. 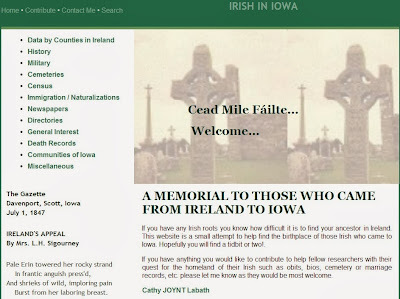 This would help North Americans of Irish descent to become more familiar with genealogy sources on this side of the Atlantic, particularly if they are only setting out on their genealogical journey. If such a document was to contain the name of a county, parish, or townland of origin this would be even better. It would also highlight where a researcher can find this information, whether it is on a cemetery headstone, military document, death certificate, obituary, or local history publication. Throughout this series, Griffith's Valuation has probably been the most important set of genealogical records that have been utilized. This has allowed the participants to find out the exact holdings that their ancestors would have rented, farmed, and ultimately left from on their journeys to the U.S. and Canada. The climax for the participant was getting to stand on their ancestors plot of land, with long-lost cousins often being the ones still living and farming there. All involved such as Red Pepper Productions, TG4, Ireland Reaching Out, The Gathering, and Aer Lingus should be applauded for creating and contributing to an innovative and stimulating genealogy show. To read a review and watch previous episodes, scroll down or click: episode 1, episode 2, episode 3, episode 4, episode 5, episode 6. 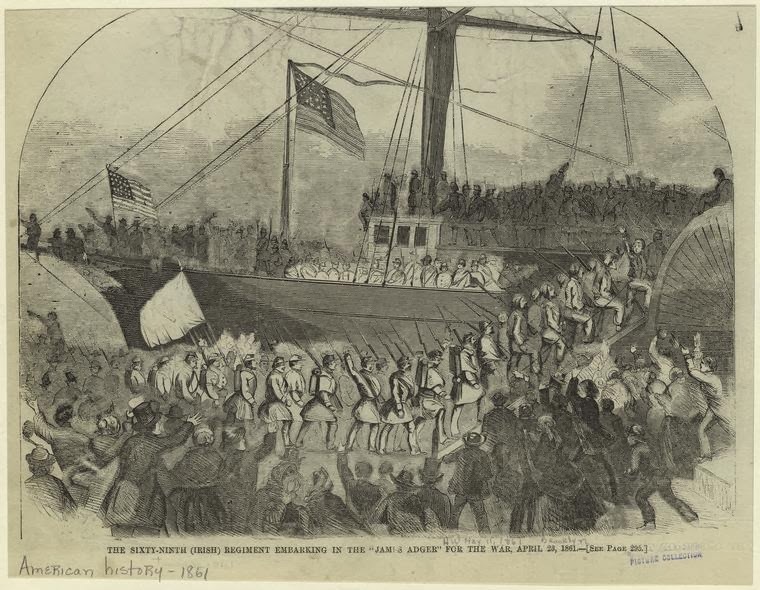 This picture shows the 69th Regiment, New York State Militia boarding the James Adger in 1861. It was originally published in Harper's Weekly: A Journal of Civilization. The caption reads: “The 69th (Irish) regiment embarking in the “James Adger” for the war, April 23, 1861.” Someone has written “May 11 1861” and “Brooklyn” above the caption. They are being cheered by a sizable crowd and one solider is holding a flag with what looks possibly like the emblem of a harp on it. If you have an interest in the participation of the Irish in the Civil War then you should consult the excellent and aptly named website, Irish in the American Civil War. Note: Thanks to Harry Smeltzer of the Bull Running's blog for pointing out that this is a picture of the 69th Regiment, New York State Militia and not the 69th Infantry Regiment (New York). The final episode of the engaging genealogy show Tar Abhaile was on last night (Sunday). This episode had special resonance for me as it dealt with my present and past. County Mayo was featured, where my mother's family come from, and one of the participants was from my new home state, Virginia (and not too far away, at all, from where I live and work!). This weeks focus was a family reunion for the Feerick sept in Ballinrobe, Co. Mayo. The name is a great example of how surname research can be so vital. MacLysaght outlines that the name, Mac Phiaraic (a derivative of Peter) in Irish, is very closely identified with Ballinrobe and originated as a branch of the Bermingham's of Dunmore, Co. Galway. The second half of the show was about Chuck Feerick and his son, Chuck jnr. Chuck snr's great-grandfather, Patrick, left Ireland about 1885. For Chuck, the interest lay in Patrick's parents, John and Cecily Hynes. He wanted to find out more about their lives, including where they were married. In the show Chuck mentioned that Patrick Feerick was first in Rochester after he emigrated from Ireland. In the image, below, from the 1900 federal census, you will see a possible listing for Patrick (PJ) and his family. An often asked question is why emigrants go to certain towns and cities in the US. In this household, there is also an uncle of PJ's, 75 year old James Hamilton. He could have been a relation from a previous generation that came to the U.S. and provided the first link for chain migration. As an aside, an interesting note is that Mike Feerick is on the advisory board of Ireland Reaching Out. This is the umbrella organization under which many of the research groups featured in the show operate. To read a review and watch previous episodes, click: episode 1, episode 2, episode 3, episode 4, episode 5. MacLysaght, Edward. The Surnames of Ireland. 6th ed. Dublin: Irish Academic Press. 1999. p. 106. "United States Census, 1900," index and images, FamilySearch (https://familysearch.org/pal:/MM9.1.1/MSJW-9YX : accessed 23 December 2013), P J Feerick, Election District 5 Rochester City Ward 11, Monroe, New York, United States; citing sheet , family 103, NARA microfilm publication T623, FHL microfilm 1241075. If you are just getting started with your family history research, or are finding out that you have Irish ancestors who emigrated in different decades, then this concise review of Irish emigration will be of help to you. 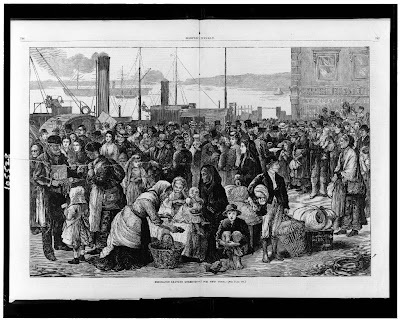 Compiled by Cath Madden Trindle, CG, it breaks down Irish emigration into pre-famine and famine generations, ports of embarkation and arrival, and suggestions for the types of records that will lead you to the townland of origin. You can access it here, on the website of Santa Clara County historical and Genealogical Society (California). I have written before about the excellent Irish in the American Civil War website. Last week, the author, Damian Shiels, wrote a lengthy piece titled, "How to Find American Civil War Veterans from Irish Counties: A Case Study of Matthew Dooley, Roscrea [Co. Tipperary]." In this article, Damian uses the example of his research on Matthew Dooley to highlight many resources of relevance when it comes to Civil War research. There is a New York State angle to this research too. This makes the article even more useful as the vast majority of Irish in the Civil War were from the state of New York. It is a must read if you have Civil War ancestors and are looking for your townland of origin. The coming of millions of Irish people to Canada and the United States led to the creation of charitable, benevolent, and fraternal organizations for these immigrants and their descendants. One such example that I recently came across is the Benevolent Irish Society (BIS) in St. John's, Newfoundland. The BIS was founded in 1806 by prominent Irish residents to aid orphans, neglected children, the sick, the old, and disabled on a non denominational basis. Membership in the society is restricted to those of Irish descent. The organization is still in existence today, over 205 years later. A history of the organization is available on this Newfoundland and Labrador website. Such societies are of obvious genealogical use as they regularly printed lists of members, officers, and those who gave financial contributions. Some of these 19th century records are housed in the Archives and Special Collections at the Memorial University of Newfoundland and Labrador. Another accessible example of records for the BIS is this early, excellent list of all members and donors for the 1806-1807 period. Association of Newfoundland and Labrador Archives. Fonds - Benevolent Irish Society Fonds. 2013. https://arc.anla.nf.ca/benevolent-irish-society-st-johns-n-l: accessed 20 November 2013. The hustle and bustle of life waiting on the Queenstown (Cobh, Co. Cork) docks is on display in this vivid print from a wood engraving, titled Emigrants Leaving Queenstown for New York. People of different social classes can be seen waiting for the boat, from the boy without shoes in the foreground to the men with top hats in the background. The image was published in Harper's Weekly on 26 Sept, 1874. In this week's Tar Abhaile, Angie Mihalicz from Beauvail, Canada avails of the assistance of the North Kerry Reaching Out volunteer group (to see reviews and watch previous episodes, click: episode 1, episode 2). Her great-grandfather, Peter McGrath, went to Canada with his mother Ellen in 1847. She knew Peter had come from somewhere on the Shannon river in Kerry and was very curious about how her ancestors made the journey to North America. Both stories in this episode show the importance of acknowledging and then ignoring county boundaries and, instead, thinking regionally. People from north Kerry didn't just live, marry, and work exclusively in the county. They also did these things in neighboring Limerick, along with, of course, emigrating from the port there. It is important to remember this for anyone who has found an ancestor living near a county boundary. This was also the first story in the series that focused on the passage across the Atlantic in detail. Why they might have chosen Canada, the types of ships, how they might have heard about the service, and the conditions of passage were all discussed. The Ordnance Survey maps, created in the 1830s and then used later in the century for Griffith's Valuation, are also highlighted. For those who can pin-point their townland of origin in the mid-19th century, these maps provide such detail that the house of residence in the field can be found in most circumstances. Towards the end of her journey Angie touched on a facet that is experienced by many people in north America tracing their Irish ancestors—their American and Canadian born relatives of previous generations not talking about their past, or wanting to acknowledge their Irish ancestry in any great detial. Memories of 19th century discrimination against the Irish lingered long and this can make it harder for those with Irish ancestry to research their family history. So does Angie find her townland of origin by the Shannon? Watch below to find out.